Moonlight Buttress is one of the most aesthetic sandstone crack systems in the world. After a few traversing pitches you reach 600 feet of continuous vertical and overhanging cracks in great sandstone. 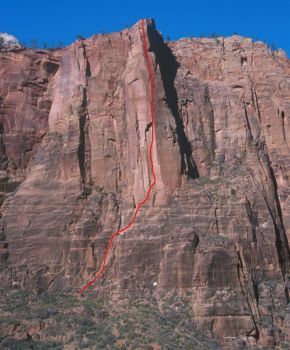 The climbing is steep and exposed to the last moves. This is THE 5.12 multi-pitch crack free climbing testpiece in the country as well as one of the best sandstone big walls in the world. The crowds are intense in peak season (Spring and Fall). Also, beware of potential raptor closures in the summer as well as fluctuating river levels that can affect the approach. Free topo download at the obscurities page.